In the Venn diagram of my family’s food preferences, there is not a lot of overlap. I’m on a low carb diet, and they are decidedly not. But one exception to the rule is Jello. We can all agree that it is delicious. And I just discovered that you can use it to make your own gummy candy at home. All you need is Jello, Knox Unflavored Gelatine and some candy molds. My kids can’t tell the difference between sugar-free and regular Jello, so I’m able to trick them into eating sugar-free candy. These homemade sugar-free gummy candies have zero carbs, so they make great low carb treats. 1. Mix together the Jello, unflavored gelatine and water in a medium sized saucepan. 2. Cook over low heat until fully dissolved, about 2 minutes. 3. 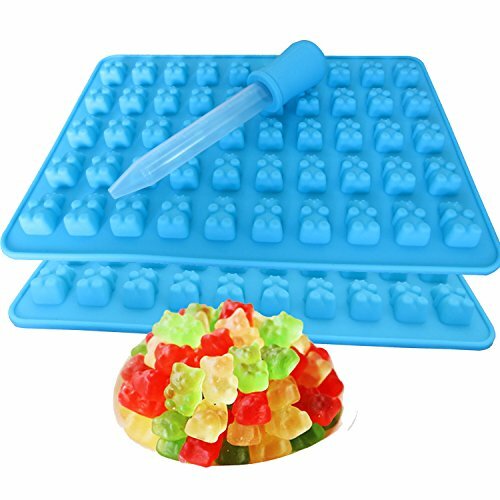 Fill the wells of a candy mold with the Jello, using a pipette. 4. Refrigerate for 30 minutes until fully gelled. Remove from the mold and serve. If you liked this gummy candy recipe, then you might like my recipes for Lime Coconut Gummies, Raspberry Cream Gummies, or Creamsicle Gummies. Can you make these using Agar powder? No, I’m afraid not. Agar is much more powerful than unflavored gelatin (1 teaspoon agar powder is equivalent to 8 teaspoons gelatin powder) so the quantities just don’t work out. You can, but you don’t need to. Put them in an airtight container and they’ll last in the fridge or on the counter for up to 2 weeks. My kids LOVE these now. They have no idea they are sugar free. And I’m not telling them. They will never be the wiser. Just ordered molds Thanks for recipe and link!! !